Per Se houses several mid century modern case pieces or case goods from the twentieth century. 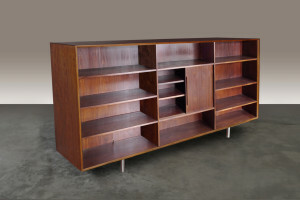 These include high quality credenzas, bookcases, cabinets and sideboards in rosewood and teak. Please inquire for more information. Who isn’t looking for more storage space to better organize their possessions? These classic pieces not only help keep a room free of clutter but also add a beautiful aesthetic to any room. 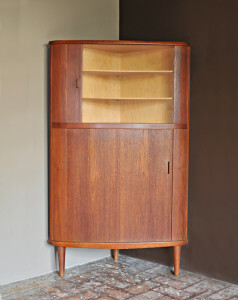 The Scandinavian influence can be seen in Mid Century pieces across Europe, the United States and here in Mexico. 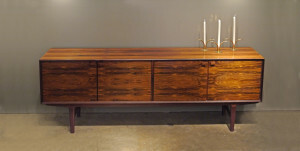 They are constructed to last with beautiful wood finishes including rosewood and teak. Fredrick Kayser was one of Norway’s most respected Scandinavian modern designers. He designed for several of Norway’s most famous furniture manufacturers. He specialized in pieces that are bright, modern, light, and functional. The British brand G Plan is one example of a company that embraced Scandinavian Modern influence. 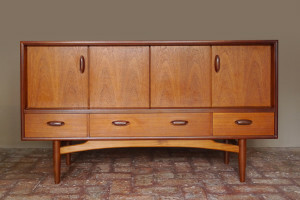 They began producing exceptionally well-balanced pieces during the postwar period. 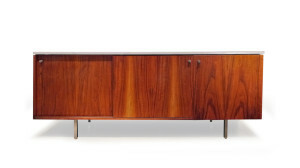 Victor Wilkins reflected this in his credenza design.